The Dedenbear Disc Throttle Stop mounts underneath a Dominator® carb and when in the open position, there is absolutely no restriction to the airflow! When in the closed position, the airflow openings are on the middle of the carb bores. This is the ideal location for controlling the air/fuel flow for maximum repeatability. This feature is the answer for solving the common tire spin issue when the stop initially closes and even when it kicks open further down track. There are a few cars with a lot of power in the super classes causing them to be even more prone to spin or "chatter" while coming off the stop, Dedenbear has the answer for that as well with their second stage kit allowing the stop to open and close in a two stage process to help the car accept the power more smoothly when the stop kicks open. Finely polished components provide silky smooth movements and precise positioning of the airflow discs. Only 1-1/2'' tall, it clears most scoops. 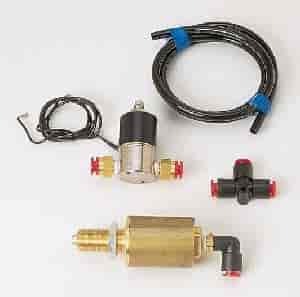 Each Dedenbear Disc Throttle Stop comes complete with the stop itself, the CO2 solenoid valve, air lines, necessary fittings and a full set of instructions.